Sea to Summit Ether Light XT Sleeping Mat. The new Ether Light XT Air Sleeping Mat is perfect for warmer-weather backpackers and campers looking for a quiet, lightweight air sleeping mat that offers a high degree of comfort. The XT Air-Sprung Cells™ use loops of a strong, flexible material to provide a plush sleeping experience. IS THIS AIR SLEEPING MAT…? Warm enough for four-season use? No. 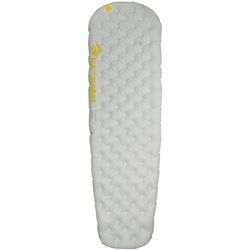 This air sleeping mat has a tested R-Value of 0.8, and is designed for use from late Spring to early Fall. Colder-weather users should choose the Ether Light XT Insulated version. Easy to inflate? Yes! The supplied stuff sack features an integrated Airstream Pump – just a couple of breaths will inflate the air mat. Suitable for backpacking? Yes. The Regular size weighs only12.4 ozs / 350 g, and packs down to 3.5” x 7.5” / 9 x 19cm) – ideal for summer backpacking, bike touring and camping. R-Value of 0.8 is designed for warmer-weather use. Quick and easy inflation, deflation and adjustment made possible by the patent-pending multi-function valve and supplied Airstream Pump™/stuff sack.